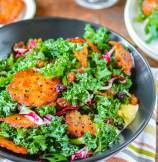 A healthy take on Caesar salad - "Kale" Caesar with mayo-free and vegetarian Caesar dressing. Starting Monday with healthy and crisp Vegetarian Kale Caesar Salad with crunchy radicchio, sweet raisins and a vegetarian eggs-free, mayo-free Caesar dressing (without anchovies). 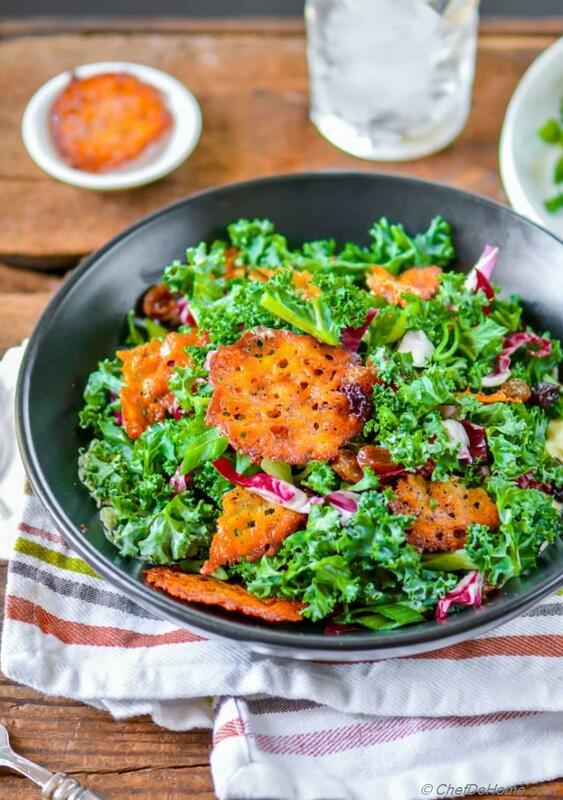 Oh, and crunch bomb in this Kale Caesar salad is 10-min easy 2-step Parmesan Crisp croutons which are also gluten free. This is my take on enjoying a classic Caesar Salad with healthy twists. Since raw eggs and I don't like each other and I happen to loooove "Kale" so much that Vegetarian Kale Caesar salad is often in my dinner menu with leftovers in lunch box. Yes, you reading correct! "Leftovers"! Unlike Romaine Caesar with regular mayo dressing which will gets soggy and loose it's flavor when kept dressed in for long.... Kale Caesar Salad stays fresh longer and is equally delicious when packed for lunch the next day! What else do I want from a homemade salad? 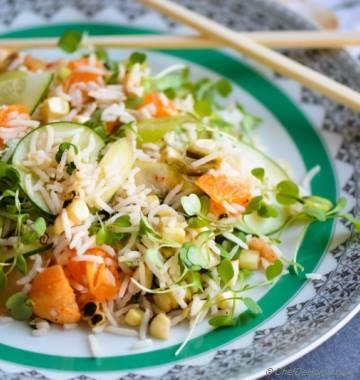 Freshness, health, and lots of flavor! You guys! Look at the colors!! Don't these remind of a Sunny Spring Day!? First time, I ate "Kale" Caesar in an Italian restaurant. Actually, I should say, I ordered it, loved the concept of "kale" Caesar but couldn't eat it since it had classic mayo dressing. Even though I often make mayo based Caesar dressing for Vishal... I can't eat it. So, that day... I dig every part of that Kale Caesar salad without taking any spoon to mouth.... inspecting everything they done to make Kale Caesar delicious and looking so good. You know what I loved most about that Kale Caesar Salad? Raisins, and parmesan crisp croutons! I must tell you that parmesan is MUST ingredient in every Caesar Salad. It is as important to a Caesar Salad as is the creamy dressing. But, adding it as Crispy Crouton instead of just shaved or sprinkled is sure a smart move. In restaurant I told Vishal... Even though I couldn't eat this Kale Caesar Salad, I have a recipe idea worth the money spent. These bread-free croutons add crunch to salad yet keeps it gluten free too! So I thought, why not make a Kale Caesar salad with crispy parmesan crisp croutons that is also may or eggs free which I can actually eat! So, here you have it! 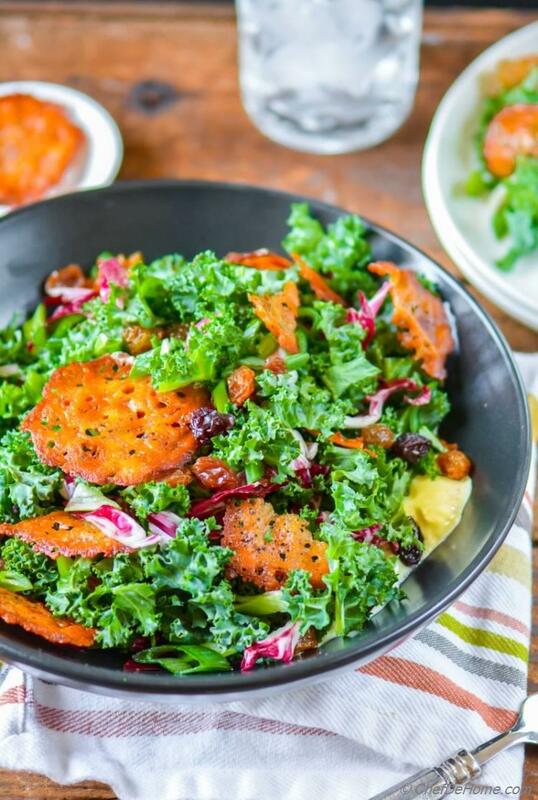 A gluten free, healthy kale "Caesar" salad with vegetarian Caesar dressing which will blow your mind! No, it doesn't need Veganise as mayo replacement. My idea of creamy Caesar dressing has a simple, easy-to-find-in-refrigerator ingredient! Cream Fraiche is just a European version of Sour Cream or Mexican Crema works equally well too. Perfect amount of creaminess, richness and tartness.... I'm addicted to enjoying lots of my Mayo-based salad as "mayo-free" using sour cream. To make pictures look more refreshing... I spread the Caesar dressing at the bottom of bowl (peeking in right corner, with hue of yellow mustard and cream fraiche!). Otherwise also, it is a good way to serve salad with dressing at the bottom of bowl. 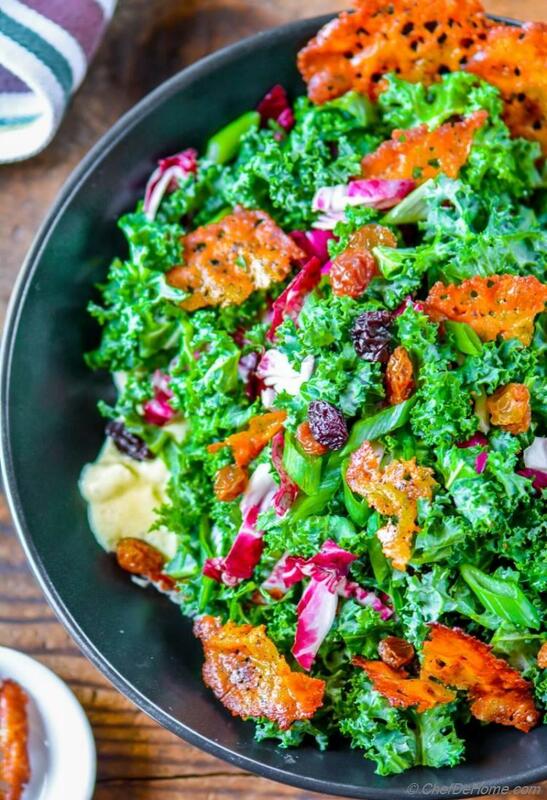 All I see is crisp greens, also parmesan crisps stays crunchy without dressing... Then as I dig-in, I end up with little creamy dressing with every bite of kale or radicchio with sweetness of raisins here and there. Or You can toss the salad in dressing. I would just add the Parmesan Crisps on top just before serving. I only use low-fat sour cream or cream fraiche and no oil which keeps Caesar Salad low in fat. There is only 1/2 of parmesan used to make crisps. Trust me, 1/2 cup makes lots of crisp crouton coins! You would need just a 4-5 per serving. 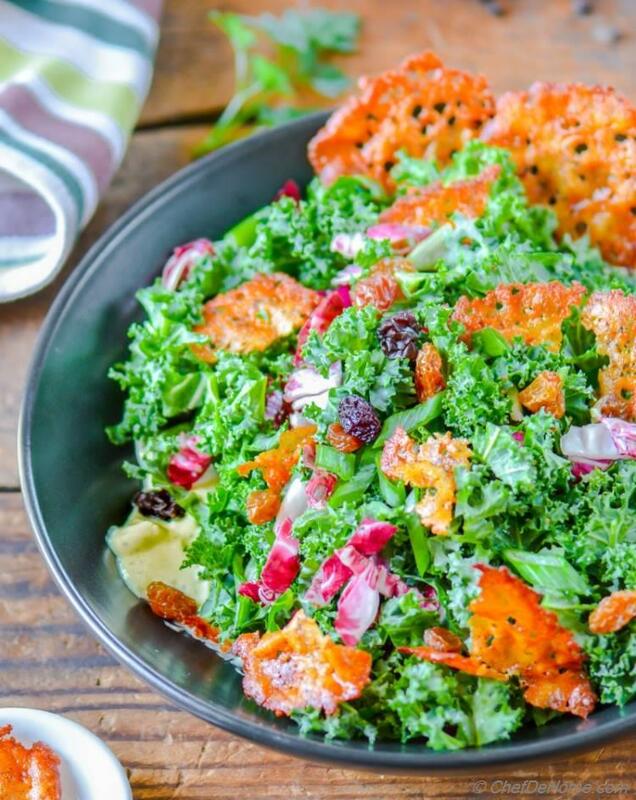 Overall, this Kale Caesar Salad is healthy, nutrient rich, gluten free, mayo free, fish free (without anchovies) and also low in fat.. Also, taste delicious, looks colorful just like the fresh flowers of Spring and is great to serve in BBQ grilling parties. Make a bigger batch as it vanishes very quickly. For parties, always make vegetarian sides/salads/appetizers double the amount of meats/poultry as everyone would want to try vegetarian sides. I hope you enjoyed Easter Sunday?! Wish you a great week ahead! Check back soon since this week I'm bringing lots of fresh Spring flavors with my recipes!! Let's head to the recipe! Total Time 18 minutes Prep Time 10 minutes Cook Time 8 minutes Difficulty Easy Yields 4 Servings Serves 4 Notes No. of servings depends on serving size. 1. Preheat oven at 350 degrees Fahrenheit. Line a baking sheet with silicon mat or wax paper. 2. 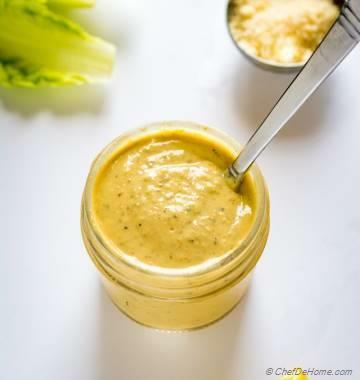 Vegetarian Cesar Dressing - Combine all dressing ingredients in salad bowl, whisk to combine. Taste and adjust salt. Set aside. 3. Parmesan Crisps: Place grated parmesan on silicon lined baking sheet in 1 teaspoon heaps, of size of coin (an inch or two apart). Bake in oven for 7-8 minutes (watch last 1 minute so parmesan not burn). Remove from oven, transfer immediately onto wire rack to cool down. 4. 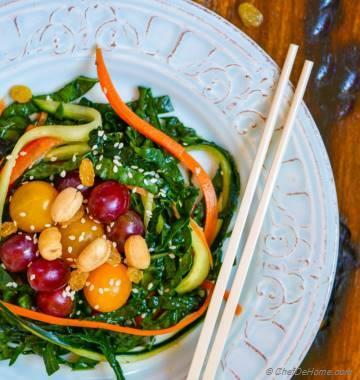 Toss Kale Caesar Salad- Chop kale, radicchio, green onion, raisins and transfer to the salad bowl with dressing. Toss to combine. Top with parmesan crisps and serve!